Subaru may not be the biggest automaker around the globe, but they know what their market niche is and they are doing it better than just about anyone else. They are building some of the best all-wheel drive vehicles on the planet, they have a great safety record and they are appealing to a generation of young buyers who are looking for fuel-efficient functional crossovers. 2012 was a banner year for Subaru and they have reported record sales for December 2012 and also for full year 2012. The Japanese automaker sold 36,653 vehicles here in the U.S. in December, which is the best sales month in Subaru history. Subaru also announced record-breaking annual sales of 336,441, which represents a 26 percent increase over 2011. This is the fourth consecutive year of sales records for Subaru of America and fifth consecutive year of sales increases. Subaru is the only manufacturer to increase sales each year for the last five years. Subaru is doing a lot of things right and one of the brightest stars for the company is the new Impreza that was introduced last year. Annual sales for Impreza have increased an impressive 148.9 percent over 2011. The 36 mpg Impreza is attracting new buyers faster than any other car in the Subaru lineup. The impressive numbers are do to the new exterior styling, a new stylish cabin and improved fuel-economy. An all-new 148-horsepower 2.0-liter four-cylinder engine that was downsized from last year's 2.5-liter, produces similar power and performance, but fuel efficiency has been increased by a whopping 36 percent. 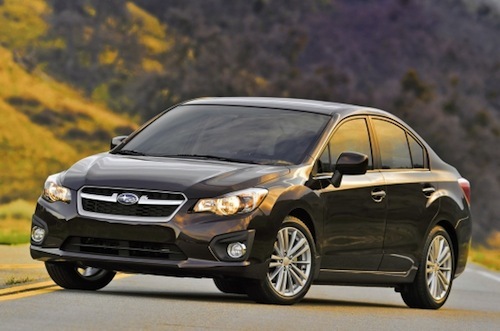 The new Impreza 2.0 gets a stellar 36 mpg highway estimated fuel mileage rating with the CVT. That makes the Impreza the most fuel-efficient all-wheel-drive gasoline-fueled car on the planet. Subaru is producing many successful models for buyers. Year-to-date sales for the newly-refreshed Outback and Legacy models have increased 13 percent and 11 percent respectively. The popular Outback continues to be the number one selling car is Subaru’s lineup. The newly introduced 2013 BRZ and XV Crosstrek models also added 3,906 incremental sales for the month of December and 11,540 units for the year. The BRZ is one of the fastest selling cars around the globe and move off dealer lots quickly. Subaru is increasing production at their Indiana plant in order to keep up with the global demand. Subaru has also launched the all-new 2014 Forester that has already exceeded sales expectations after only one month. The new Impreza is the big story for Subaru last year, but look for Subaru to continue to set new sales records in 2013 as the new 2014 Forester and a new Subaru hybrid is launched this year.